Hopdoddy Burger Bar, the Austin, Texas-based burger and beer restaurant, has opened its first location in Orange County. The eatery set up shop in Newport Beach’s swanky outdoor shopping center, Fashion Island. The menu is highlighted by a list of burgers featuring all-natural, hormone- and antibiotic-free Black Angus beef, which is grinded in-house. Guests are able to pair their burgers with a selection from the list of local craft beers. Hopdoddy Burger Bar, Fashion Island, 401 Newport Coast Dr., Ste. 311, Newport Beach, CA 92660, No phone available. Charlie Palmer’s at Bloomingdale’s South Coast Plaza will be closing its doors after a seven-year run. 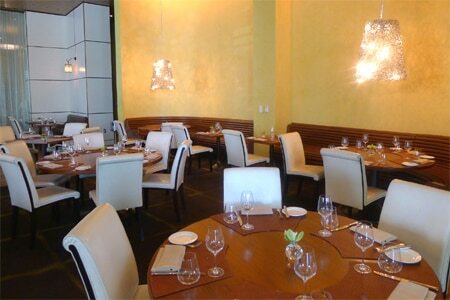 The restaurant, which has been one of the culinary flagships of the famed Costa Mesa shopping center, has announced that its last day of service will be May 2, 2015. It was also announced that the restaurant will be replaced with gourmet burger concept Holstein’s Shakes & Buns. The new eatery, whose original location is in The Cosmopolitan Hotel & Casino in Las Vegas, is slated to open late summer. Charlie Palmer's at Bloomingdale's South Coast Plaza, South Coast Plaza, 3333 Bristol St., Costa Mesa, CA 92626, 714-361-4264.